Lots of community groups and voluntary organisations find it can be a challenge to get people involved – both for formal volunteering roles and helping out in less formal ways. It can be a particular problem in rural areas and for groups which are looking more to older people. But there are also lots of groups who are finding solutions! Tips for Getting People Involved is the first joint publication from the Rural Wisdom project. The Welsh language version is on its way and will be out soon. Our Tips draw together the experiences of people in the main locations in Scotland and Wales plus more suggestions and advice from people we have met in other places. Together, they show how people contribute to making their communities work well and be sustainable and resilient. * Practical suggestions to help community groups deal with challenges such as existing volunteers finding they are doing more, are no longer able to do so much and potential volunteers are reluctant to taking on the burden. * Ways people across the generations work alongside each other and support each other in volunteering roles. * Celebrating and supporting the contributions older people make to their communities. Outside the Box and Volunteering Matters Cymru want to thank everyone who is part of the great work going on in these and all the other rural communities. We’re hoping these tips will encourage more people to share your experiences and examples. What are you trying to get more people involved? What is working well and what are you learning? 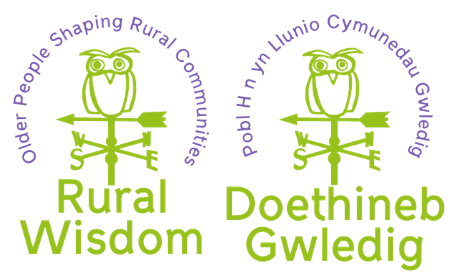 Rural Wisdom is funded by Big Lottery Fund through the Accelerating Ideas programme. ← Access to digital technology – tackling the barriers for older people living in rural areas.